Thursday, January 20, is Take Back the Tea Party Day. It is a holiday that a friend and I came up with, sick of politics, sick of animosity. We decided to take back the tea party, full of deliciousness and elegance. What better tea party treat than a traditional trifle? I've actually never made trifle before. And I didn't *exactly* follow a recipe, so I'm not sure how it turned out yet, but I think the picture makes it look like a giant dessert goblet. I looked through hundreds of pictures and recipes and they all seemed to include some kind of cake, some kind of fruit, and some kind of creamy mixture somewhere in between custard, pudding, and whipped cream. Well, those things I can do. First, I started with pound cake. Since one of my goals for the year was to find a go-to pound cake, I went with the Million Dollar Pound Cake recommended by a friend, Laura G2. I did something wrong, clearly, since it didn't come out of the pan very well. It is a good thing I'd intended it for trifle all along! I trimmed off the top, sliced it up, and sandwiched strawberry jam in between the slices. The slices got diced into 2" cubes. I made a cooked vanilla pudding, and after it cooled slightly, it was mixed with some fresh whipped cream and a jar of lemon curd. I cooked some frozen cherries and blueberries (mid-winter not being the most seasonal of times to decide to make a trifle! ), and used the juice from that to soak the cake layer. I didn't want to use alcohol this time around because of all the pregnant women at work. Nobody wants to be excluded from a tea party! The fresh fruit I saved for the outward facing layers- strawberries on the bottom and kiwis around the top. I basically layered cake - fruit - cream, repeated, and took it to work to stick in the fridge until tomorrow. It must weigh 25 pounds. I hope there isn't too much liquid inside, but it will probably still taste delicious. Because that's what tea parties should be... delicious. Check out the Worldwide Take Back the Tea Party Event, and feel free to join in on the celebration! Last year, I purchased kumquats and they went bad before I ever did anything with them. This year, I was determined to do at least one thing! 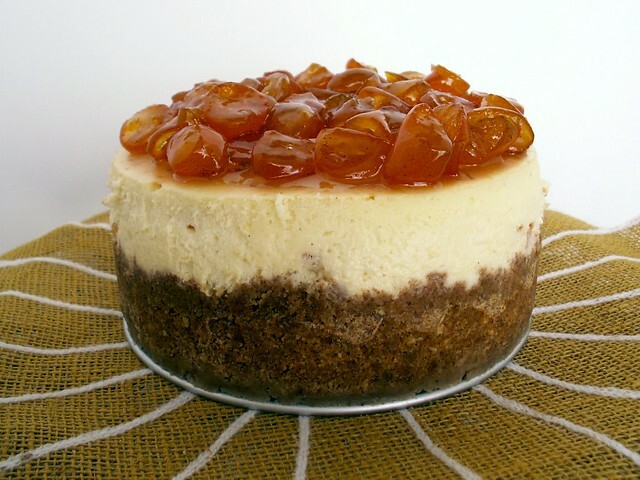 I had come across a recipe for orange cheesecake with candied kumquats, which seems to be the go-to kumquat recipe on the web. I've heard other suggestions, like kumquat screwdrivers, which also sound delicious. 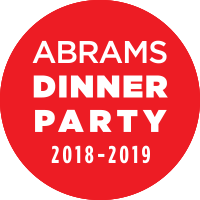 Ever since last April when I hosted the Daring Bakers Cheesecake Challenge, I knew I'd want to return to the delicious and creamy cheesecake recipe provided by my good friend Abbey from Tastes Like Burning. While I used the candied kumquat recipe in the original link in this post, I adapted Abbey's cheesecake recipe for this dessert. I candied the fruit first, and then used 2 tbsp of the remaining syrup instead of the lemon juice and liqueur in the cheesecake. Then I took about 1/4 cup of the candied fruit and diced it up, folding it into the cheesecake before baking (I was baking a 6 incher this time around). Honestly, I felt like the cheesecake was the best part. The candied kumquats on top threw off the balance a little, especially since their flavor was already so present in the cheesecake itself, and the sweet-tart was lovely with the creamy cheesecake. 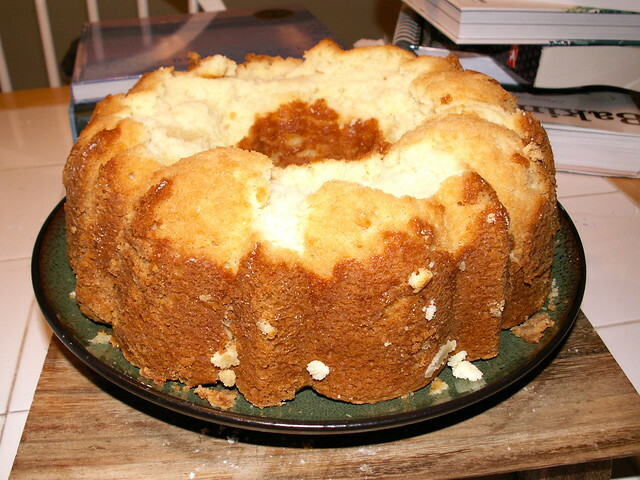 One of my baking resolutions for 2011 is to find a go-to pound cake recipe! I got a lot of great recipes from people who read the blog or follow me in Twitter, and I'm excited to try them over the course of a year. I was thumbing through the second volume of Mastering the Art of French Cooking by Julia Child since I got it for the holidays, and stumbled across a cake recipe called "Le Quatre Quarts." I knew that I would have to start with Julia! It isn't quite exactly pound for pound on the ingredients, and the recipe does have a few interesting quirks. First of all it is only large enough for an 8" round pan, so if I made it again I'd have to work with the ratios to fill a bundt or loaf pan. (It might just need to be doubled). The most interesting thing was how it is mixed - first the eggs, sugar, and citrus zest. Then the flour. Then the butter, which has been whipped into a mayonnaise texture. I was skeptical but followed her exactly, and was pleased with the results. The best part of the cake didn't end up in the served dessert - it domed up too much and had to be trimmed off, but that part was crackly and sweet. The rest of the cake had a fine crumb but wasn't dry. I made Julia's Creme du Citron from the next page to fill the middle of the cake, and it was like a creamy sweeter lemon curd. We seem to have a lot of babies coming at work (don't drink the water). 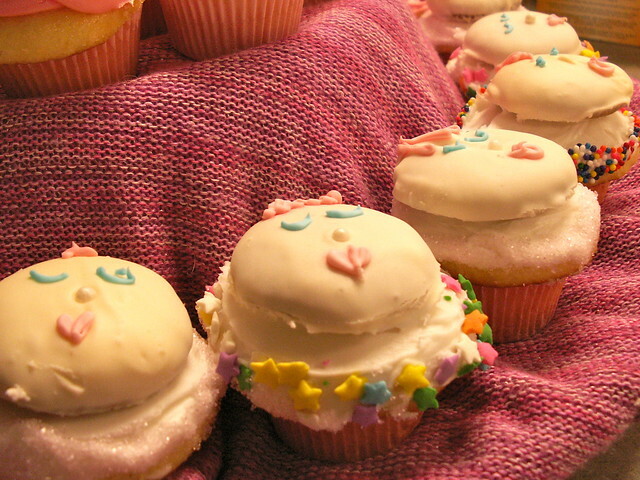 For today's baby shower, I made little miniature cupckes, some with little faces! Most had little kissy mouths, but some looked like they might be crying or singing. I got the idea from What's New Cupcake? a book with cute ideas that relies a little too heavily on pre-made foods. 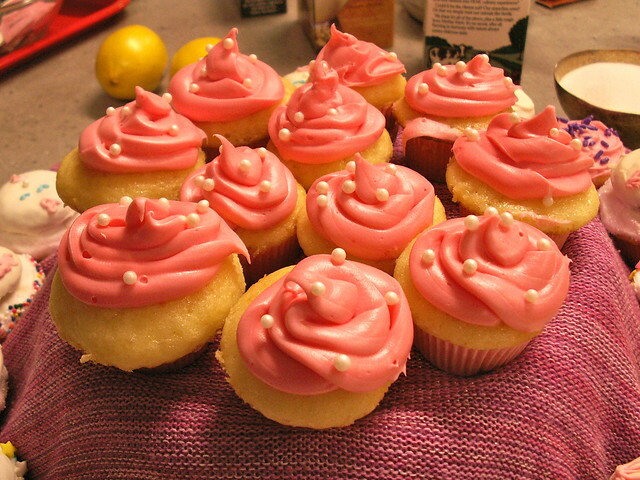 With the rest of them, I just did pink swirls and little pearls. Congratulations to Andrea and Dave! I'm all over the blogosphere making resolutions for 2011 today. I've always been a big believer in setting goals, but last year's resolutions were pretty vague or huge, and I didn't do them very well. This year I'm setting resolutions for gardening and cooking as well, because there are some things I want to do! Picking five baking resolutions was difficult. I want to try the ones I failed this year again, but I've made some of them more specific so I'm more likely to accomplish them. I could use some feedback on #5, and you'll see why! Now that I'm a southerner, it is almost blasphemy that I don't have a go-to pound cake. I've been collecting recipes this year from Facebook and blog feeds, and I'm excited to try a few of them out. I don't mind using someone else's recipe as my go-to recipe, but maybe I can tweak one and really make it my own. 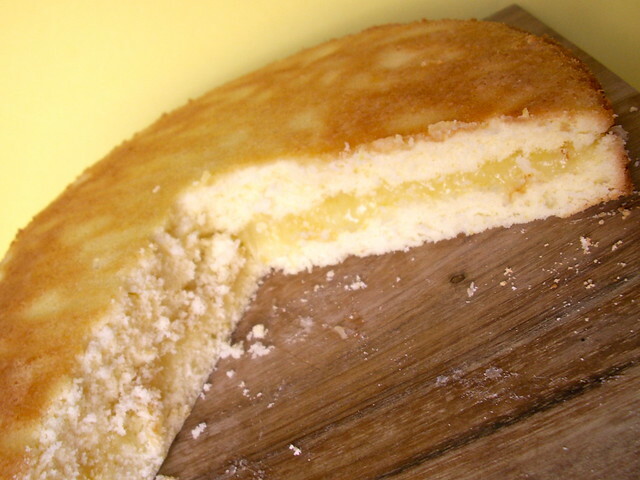 Most traditional pound cake recipes are passed down, so if you want to pass me yours, please do! 2. 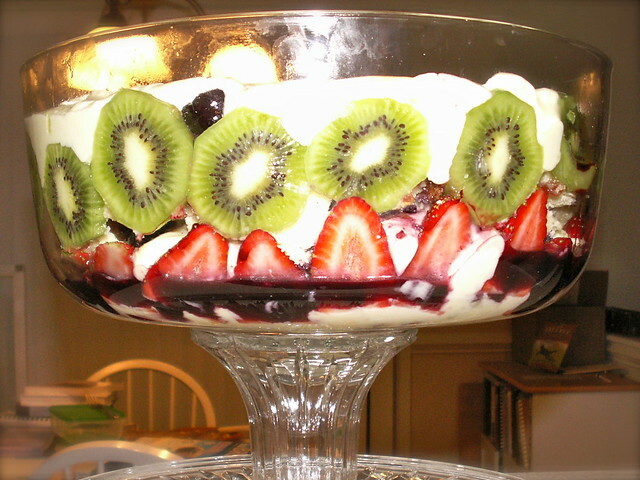 Trifle - make one. Yeah, this might look familiar since it was an unfulfilled goal for 2010. Poor, lonely, anxious trifle dish. Luckily, this will pair nicely with resolution #1. I also have my "Take Back the Tea Party" event coming up on election day, so that would be more than appropriate! Last year I made a pretty nebulous cake resolution. This is one of the ways I've broken it down. I've never made poured fondant, and I want to find a classic recipe to have in my back pocket. I would accept using it on cupcakes or to make petits fours, but at least one of those things. Luckily I have some baby showers coming up that this would be perfect for. It's baaaaaack! I have only made the marshmallow variety, and have fully intended to make the classic rolled fondant. I've even had long conversations through blog commenting about it, and know whose recipe I want to try first. I just need to DO it. This is the one I really need help with. I need to find a way to make it more specific, or quantifiable. I don't want to do multi-day sourdough beast bread yet, maybe in 2012. First I just want to get more comfortable with yeast baking, kneading, rising, the usual. I have Artisan Bread in Five Minutes a Day. I have Baking with Julia. I have the Bread Baker's Apprecntice. I have the recipes but don'to know where to start. Any suggestions? I made a similar resolution last year and did nothing! There it is. Resolutions I rejected but might happen anyway (because once they attach in my brain I can't get rid of them) include the brioche tart that made Julia Child cry, raw cheesecake, and gum paste flowers. What are your baking goals for 2011?